The need for reliable energy production worldwide is growing at a rapid rate, with it being estimated that by 2050, our global energy needs will have doubled. This comes at a time when our reliance on fossil fuels is being tested as it becomes more apparent that these are not a sustainable source of energy for the future. It’s something that a few different companies are working on developing, with SolaRoad installing a cycle path paved with glass-coated panels, in 2014. The 70-metre path in the Netherlands has been generating 3,000 kilowatt-hours (kWh) of energy a year, which equates to the yearly energy usage of a small house. The cost of installing this cycle way was estimated to be €3 million, which equates to roughly 520,000 kWh of energy. Whilst this might seem counterintuitive, the fact that some countries are willing to take the risk of investing heavily in using renewable energy in creative and innovative ways shows that this is a real possibility for the future. Colas’ aim is to reduce the cost of solar-road technology, and have released a new breed of solar panel, called the Wattway. In December 2016, they opened what they have claimed to be the world’s first solar road. The road is located in Tourouvre-au-Perche, a small village in Normandy. The 1km stretch of road is covered with 2,800 sq m of solar panels, at a cost of €5 million. The road will be subjected to a two-year test period during which it is hoped that it proves capable of providing enough power to run the street lights of the village, which has a population of 3,400 people. The road will be used by 2,000 motorists a day and prior to them being installed, were tested for durability by Colas, who placed them in a number of car parks across France. Wattway has been developed so that each panel is only millimetres thick, which means they can easily be installed directly on top of an existing road surface. The panels are also coated with a layer of resin containing fine sheets of silicon, which should hopefully make them tough enough to withstand the heaviest of traffic whilst also providing a skid-resistant surface. France’s Ecology Minister, Ségolène Royal has said that she would like to work towards having solar panels installed on one in every 1,000 km of Frances roads. It is estimated that a two lane solar road would cost approximately €10 million per kilometre. Whilst this is a large initial outlay, it could prove cost effective as a long-term strategy, especially if the panels do not require regular maintenance and produce enough electricity to offset the initial cost within a reasonable timeframe. Some problems with this innovative new use of solar panels is that when they are laid on a flat surface as opposed to at a gradient, they are far less efficient. Standard, roof-mounted solar panels operate at an efficiency of about 20%, whilst Colas’ Wattway system runs at 15% efficiency. That isn’t too much of a reduction, but it doesn’t take into the account the fact that traffic, snow or standing water could block the sunlight and reduce efficiency even further. The company is now working on reducing the cost of production and also has more projects planned both in France and abroad. 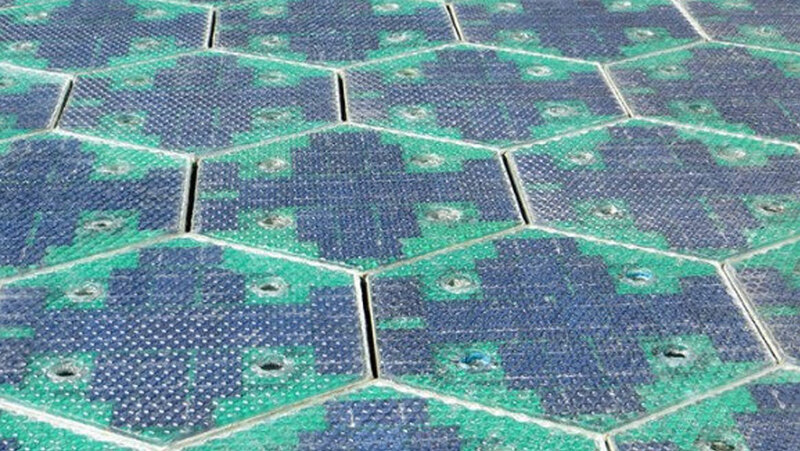 Whilst critics might suggest that the money spent on installing solar roads could be spent in better ways, solar roads certainly look like they could help pave the way for increasing the production of renewable energy into the future.